Facts and information about the History of Clothing and regalia of Native American Indians and their Breechclout. 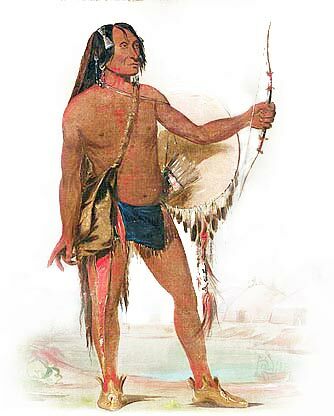 The Breechclout was the most basic item of clothing worn by all the men of every Native American Indian tribes, with the exception of those who lived in climates that were warm enough to wear nothing at all. The painting depicts E'e-a chín-che-a, meaning 'Red Thunder', who was a Hidatsa warrior. It was painted by the famous artist George Catlin (1796-1872) in 1832 and depicts the minimal war-dress of Native Indians. The history of traditional or ceremonial dress and regalia worn by Native American Indians is a fascinating subject. The following fact sheet contains interesting facts and information on Breechclouts. Breechclout Fact 11: The early colonists referred to the garment as "Indian breeches".